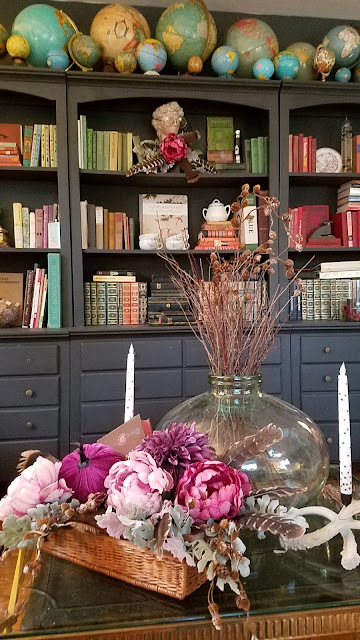 I shared my fall mantel several weeks ago. Bittersweet, found turkey feathers and owls. It felt nice and crisp. Normally I do a Halloween mantel but this year I was feeling more outdoorsy. So I switched it up. Changed the wall decor from mirror to art. I kept the books, bittersweet and a few feathers. I may have yet another mantle scape in me before Halloween. If only I didn't have to sleep I could accomplish so much more. Yours in time management, P.
I liked your first one and I like this one, too, Pam! I love the second one because that picture is wonderful. I have a thing for bunnies!